Real GDP grew 3.2 percent in the third quarter, boosted by strength in consumer and business spending and net exports and extending the 3.1 percent gain in the second quarter. According to new data from the Bureau of Economic Analysis, manufacturing added 0.24 percentage points to top-line growth in the third quarter, with mixed results for the sector. Real value-added output grew 2.0 percent for manufacturers in the third quarter, buoyed by a 7.5 percent growth rate for durable goods firms but weighed down by a 4.1 percent decline for nondurable goods businesses. Recent hurricanes hit the latter hard, especially in chemical and energy markets. Overall, manufacturing gross output increased to $6.031 trillion in the third quarter, rising to its highest point since the fourth quarter of 2014. Those findings closely mirrored the value-added data for manufacturing, which rose to $2.252 trillion in the third quarter, another new all-time high. Value-added output for durable goods increased to $1.224 trillion, with nondurable goods value-added output rising to $1.028 trillion. The bottom line is that manufacturing accounted for 11.5 percent of real GDP in the third quarter, which remained the same from the prior report. Adjusting for inflation, there was also a new all-time high for real value-added output in manufacturing, up to $1.958 trillion in the third quarter. Those figures are in chained 2009 dollars, and the latest number edged out the previous peak of $1.955 trillion recorded in the third quarter of 2007, or just before the start of the Great Recession. Manufacturers will get the first look at fourth-quarter real GDP growth on Friday, and if current estimates hold, the numbers should show the U.S. economy grew at least 3 percent for the third straight quarter. Strong consumer and business spending, combined with an improvement in exports, have helped expand the economy. The NAM is forecasting 3.6 percent growth in the fourth quarter, with 2.3 percent and 3.0 percent growth in 2017 and 2018, respectively. Meanwhile, manufacturing production rose for the fourth straight month in December, edging up 0.1 percent. While this was slower than the 0.3 percent gain in November and while more broad-based increases are preferable, the data remain encouraging overall. Indeed, manufacturing production has risen 2.4 percent over the past 12 months, down from 2.5 percent in November, which was the best year-over-year rate since July 2014. Similarly, manufacturing capacity utilization matched November’s rate of 76.4 percent, a reading not seen since May 2008. In terms of the forecast, manufacturing production is projected to grow 2.2 percent in 2018, up from 1.7 percent in 2017. At the same time, total industrial production jumped 0.9 percent in December, bouncing back after falling 0.1 percent in November. In addition to manufacturing, both mining and utilities production increased, up 1.6 percent and 5.6 percent, respectively. Utilities benefited from colder temperatures. Over the past 12 months, industrial production has risen 3.6 percent, its highest rate since November 2014. Mining and utilities output increased 11.5 percent and 1.8 percent year-over-year, respectively. In addition, capacity utilization soared from 77.2 percent to 77.9 percent, the strongest rate since February 2015. Regionally, manufacturing activity remained solid in the New York and Philadelphia Federal Reserve Bank districts despite their composite measures easing somewhat in the January surveys. New orders, shipments, hiring and capital spending continued to expand at healthy rates, even with some softening, and business leaders began the new year with an optimistic outlook for the next six months. In some special questions in the Philadelphia Federal Reserve survey, 71.7 percent of respondents said there had been an increase in demand for manufactured products over the past several months, with nearly 70 percent anticipating higher production in the first quarter of 2018. On the downside, these reports also indicated an acceleration in input costs, both for January and moving forward. Turning to the housing market, the latest releases provided mixed levels of comfort. New housing starts fell from 1,299,000 units at the annual rate in November to 1,192,000 units in December, a three-month low. The decline in activity in the latest data came entirely from a significant reduction in single-family starts, off 11.8 percent from 948,000 units to 836,000 units, with notable decreases in every region of the country except the West (which was unchanged). Poor weather might have played a role in diminishing activity in December. More encouragingly, single-family starts have increased 3.5 percent over the past 12 months, up from 815,000 units in December 2016. Such news might be more discouraging if there was not an expectation that December’s softer data might be a temporary blip toward stronger figures in the coming months. Along those lines, homebuilder optimism remains highly elevated with a healthy outlook for sales over the next six months. In addition, housing permits were also solid, essentially unchanged but down from an annualized 1,303,000 units in November to 1,302,000 units in December. It was the third consecutive month with permits—a proxy of future activity—exceeding 1.3 million units, with December’s reading not far from the 1,316,000 figure in October, which was the highest point since August 2007. Housing permits have risen 2.8 percent year-over-year, up from 1,266,000 units in December 2016. This week, new surveys from IHS Markit and the Richmond and Kansas City Federal Reserve Banks will report on the health of manufacturing; they are expected to indicate continued expansion of the sector. Other highlights this week include updates on durable goods orders and shipments, existing and new home sales, the international trade in goods, leading indicators and state employment. Other top contributors in the third quarter to real GDP included finance, insurance, real estate, rental and leasing (1.10 percent), information (0.42 percent), professional and business services (0.40 percent), educational services, health care and social assistance (0.39 percent), retail trade (0.36 percent), wholesale trade (0.21 percent) and mining (0.16 percent). In contrast, drags to growth included utilities (-0.10 percent), construction (-0.05 percent) and agriculture, forestry, fishing and hunting (-0.02 percent). Overall, manufacturing gross output increased from $5.949 trillion in the second quarter to $6.031 trillion in the third quarter, up for the sixth straight report and rising to its highest point since the fourth quarter of 2014. After struggling with a number of global challenges over the past few years, these findings help to illustrate recent improvements. Gross output from manufacturers has stabilized since bottoming out at $5.607 trillion in the first quarter of 2016. In addition, gross output from durable (up from $3.029 trillion to $3.086 trillion) and nondurable (up from $2.920 trillion to $2.946 trillion) goods also increased in the quarter, with both notching their best figures since late 2014. Those findings closely mirrored the value-added data for manufacturing, which rose from $2.219 trillion in the second quarter to $2.252 trillion in the third quarter, another new all-time high. 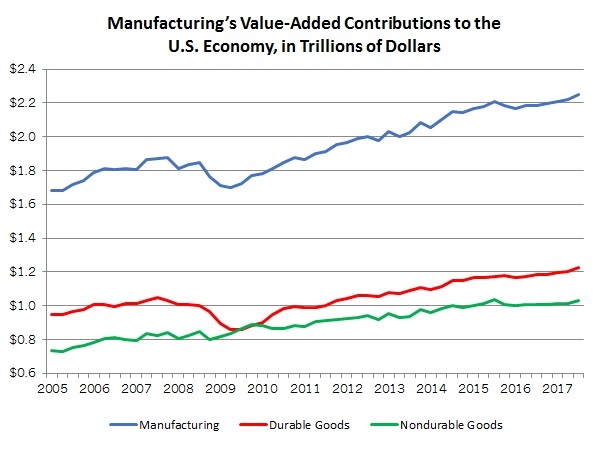 Value-added output for durable goods increased from $1.205 trillion to $1.224 trillion, with nondurable goods value-added output rising from $1.014 trillion to $1.028 trillion. The bottom line is that manufacturing accounted for 11.5 percent of real GDP in the third quarter, which remained the same from the prior report. Adjusting for inflation, there was also a new all-time high for real value-added output in manufacturing, up from $1.949 trillion in the second quarter to $1.958 trillion in the third quarter. Those figures are in chained 2009 dollars, and the latest number edged out the previous peak of $1.955 trillion recorded in the third quarter of 2007, or just before the start of the Great Recession. It bottomed out at $1.694 trillion in the first quarter of 2009 before beginning to trend higher. In the third quarter, real value-added output rose for durable goods, up from $1.123 trillion to $1.143 trillion in the third quarter, but lower for nondurable goods, off from $0.836 trillion to $0.827 trillion. The Census Bureau and the U.S. Department of Housing and Urban Development reported that new housing starts fell in December, pulling back sharply from a 13-month high in November. New residential construction decreased 8.2 percent from 1,299,000 units at the annual rate in November to 1,192,000 units in December, a three-month low. The decline in activity in the latest data came entirely from a significant reduction in single-family starts, off 11.8 percent from 948,000 units to 836,000 units, with notable decreases in every region of the country except the West (which was unchanged). Poor weather might have played a role in diminishing activity in December. More encouragingly, single-family starts have increased 3.5 percent over the past 12 months, up from 815,000 units in December 2016. At the same time, new multifamily residential construction starts inched up from 351,000 units in November to 356,000 units in December, a 1.4 percent increase. Yet, multifamily activity can be highly volatile from month to month, and over the past 12 months, activity decreased a whopping 22.6 percent from 460,000 units in December 2016. Such news might be more discouraging if there was not an expectation that December’s softer data might be a temporary blip toward stronger figures in the coming months. Along those lines, homebuilder optimism remains highly elevated with a healthy outlook for sales over the next six months (see below). In addition, housing permits were also solid, essentially unchanged but down from an annualized 1,303,000 units in November to 1,302,000 units in December. It was the third consecutive month with permits—a proxy of future activity—exceeding 1.3 million units, with December’s reading not far from the 1,316,000 figure in October, which was the highest point since August 2007. Housing permits have risen 2.8 percent year-over-year, up from 1,266,000 units in December 2016. In December, single-family permits increased from 865,000 units to 881,000 units, a level not seen since August 2007. Over the past year, permitting in the single-family segment has increased 6.1 percent. The upward movement in single-family activity helps to explain the upbeat sentiment among builders and the strong forecasts for growth for 2018 in the housing market as a whole. Nonetheless, multifamily permitting declined for the second straight month in this report, off from 438,000 units to 421,000 units, or 3.9 percent, with a year-over-year decline of 3.4 percent. manufacturing production rose for the fourth straight month in December, edging up 0.1 percent. While this was slower than the 0.3 percent gain in November and while more broad-based increases are preferable, the data remain encouraging overall. Indeed, manufacturing production has risen 2.4 percent over the past 12 months, down from 2.5 percent in November, which was the best year-over-year rate since July 2014. Similarly, manufacturing capacity utilization matched November’s rate of 76.4 percent, a reading not seen since May 2008. With that said, there has been a lot of volatility in the month-to-month data since the spring, with more recent figures whipped around by hurricanes. Along those lines, the underlying data in December showed mixed results. Durable goods production increased 0.3 percent, rising for the fifth consecutive month, whereas output among nondurable goods businesses declined 0.1 percent in December, pulling back slightly after two months of gains. The largest monthly increases in the manufacturing sector included motor vehicles and parts (up 2.0 percent), textile and product mills (up 1.3 percent), wood products (up 0.8 percent), printing and support (up 0.7 percent) and food, beverage and tobacco products (up 0.6 percent). In contrast, production fell for primary metals (down 1.5 percent), furniture and related products (down 1.3 percent), plastics and rubber products (down 0.9 percent), chemicals (down 0.7 percent) and petroleum and coal products (down 0.7 percent), among others. Meanwhile, total industrial production jumped 0.9 percent in December, bouncing back after falling 0.1 percent in November. In addition to manufacturing, both mining and utilities production increased, up 1.6 percent and 5.6 percent, respectively. Utilities benefited from colder temperatures. Over the past 12 months, industrial production has risen 3.6 percent, its highest rate since November 2014. Mining and utilities output increased 11.5 percent and 1.8 percent year-over-year, respectively. In addition, capacity utilization soared from 77.2 percent to 77.9 percent, the strongest rate since February 2015. Along those lines, homebuilder optimism remained strong in the latest data. The index for current single-family sales pulled back from 80 to 79 but continued to be highly elevated. Similarly, sales expectations for the next six months eased from 79 to 78. The largest gains in perceptions occurred in the Northeast, with sentiment slipping somewhat in other regions. More importantly, HMI data exceeded 50 in all regions of the country, illustrating mostly positive news for the housing sector overall. Manufacturing activity in the New York Federal Reserve Bank’s district eased somewhat in January but remained strong overall. In the latest Empire State Manufacturing Survey, the composite index of general business conditions declined from 19.6 in December to 17.7 in January. (Note that these figures reflect a new seasonal adjustment update for all past data points.) While the headline index decelerated for the third consecutive time, off from the three-year high of 28.1 in October, the pace of expansion has remained robust, averaging 20.6 over the past eight months. The underlying indicators reflected slower, but still encouraging, growth. This included continuing solid growth for new orders (down from 19.0 to 11.9) and shipments (down from 23.5 to 14.4), but much softer expansions for employment (down from 22.9 to 3.8) and the average employee workweek (down from 9.3 to 0.8). On the downside, prices for raw materials accelerated once again to an 11-month high (up from 29.7 to 36.2), with nearly 40 percent of respondents saying that input costs increased in January. Nonetheless, manufacturers in the New York region remained very upbeat about the next six months, much as they have for the past year. The expectations composite index rose from 46.3 to 48.6. This was not far from November’s pace of 49.8, which was the best reading since January 2012. In all, 61.5 percent of respondents felt that expected business conditions were better this month, with 12.9 percent suggesting they were not. The various indices of activity for the next six months rose higher across the board, including new orders (up from 42.7 to 47.6), shipments (up from 43.2 to 46.3), hiring (up from 24.0 to 26.9), the average employee workweek (up from 6.5 to 16.7), prices paid (up from 50.0 to 52.9), capital expenditures (up from 34.1 to 34.8) and technology spending (up from 22.5 to 27.5). Reflecting the uptick in inflationary pressures, the prices paid index was at a level not seen since May 2012. The Federal Reserve Bank of Philadelphia reported that manufacturing activity began 2018 on a solid note, even with slight easing in several measures in January. The composite index of general business activity declined from 27.9 in December to 22.2 in January, which was the lowest level since August but continued to reflect optimism overall. (Note that these figures reflect a new seasonal adjustment update for all past data points.) To illustrate the improvements in manufacturing sentiment over the past year, the headline index averaged 27.4 in 2017, up from 4.9 in 2016, and this measure has indicated expanding activity for 20 straight months. In December, the underlying data provided mixed results. Shipments (up from 23.9 to 30.3), the average employee workweek (up from 12.6 to 16.7) and raw material prices (up from 27.8 to 32.9) accelerated for the month, whereas new orders (down from 28.2 to 10.1) and employment (down from 19.7 to 16.8) softened. Meanwhile, manufacturers in the Philadelphia Federal Reserve region remained very upbeat in their outlook for the next six months, even with a slight weakening from the prior survey. The forward-looking composite index decreased from 52.7 in December to 42.2 in January, but 53.6 percent and 57.0 percent of respondents felt that new orders and shipments would rise in the coming months, respectively. Moreover, at least 40 percent anticipate additional employees and capital spending. On the downside, respondents predicted pricing pressures to grow at an elevated pace (down from 56.0 to 54.2), with raw material costs continuing to accelerate, even with a marginal easing in that index for December. In all, 54.6 percent of manufacturers completing the survey expect input costs to increase in the next six months, with just 0.4 percent seeing them declining. In special questions, 71.7 percent of respondents said there had been an increase in demand for manufactured products over the past several months, with 11.7 percent citing declines. In addition, 69.5 percent anticipate higher production levels in the first quarter of 2018 relative to the fourth quarter of 2017, with 22.0 percent predicting weaker output growth. The University of Michigan and Thomson Reuters reported that consumer confidence pulled back for the third straight month from October’s robust reading (100.7), which was the highest point since January 2004. The Index of Consumer Sentiment declined from 95.9 in December to 94.4 in January in preliminary data, its lowest level since July. This suggests Americans have become slightly more anxious in recent months despite “persistent strength in personal finances and buying plans.” Despite the easing in the headline number, “consumers continued to remain very optimistic about the low national unemployment rate,” according to the release. In the January data, respondents felt slightly more upbeat in their economic outlook for the coming months (up from 84.3 to 84.8), but the drop in the headline index stemmed from a reduced assessment of the current economic environment (down from 113.8 to 109.2). Final data on consumer sentiment will be released on February 2.